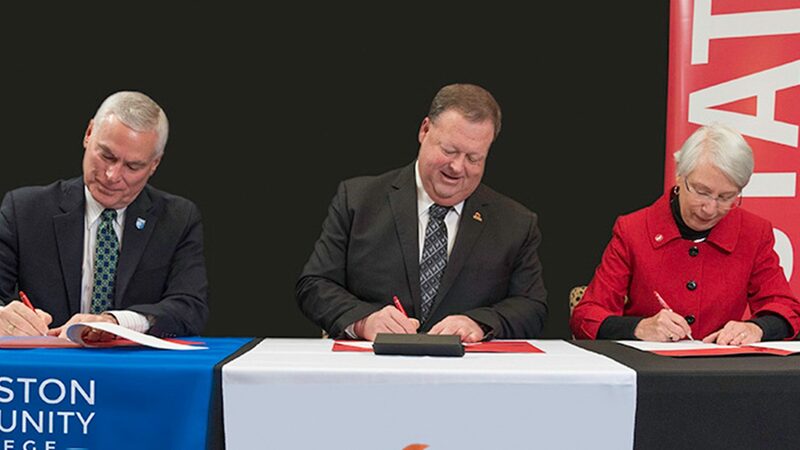 From left, David Johnson, Johnston Community College president; Ross Renfrow, superintendent of Johnston County Public Schools; and Mary Ann Danowitz, dean of the NC State College of Education, signed a memorandum of understanding Monday, Jan. 14, launching the Associate in Science (Teacher Education Concentration) dual enrollment degree program. SMITHFIELD, N.C.—Johnston County Public Schools, Johnston Community College and the NC State College of Education are establishing a dual enrollment program and piloting an Associate in Science (Teacher Education Concentration) degree to create an affordable pathway to earn a teaching degree and to supply highly-qualified teachers for Johnston County. Through the partnership, Johnston County residents will complete their Associate in Science (Teacher Education Concentration) from Johnston Community College. If they complete the program with at least a 3.0 GPA, they will matriculate into a teacher preparation program at NC State University. As the students work toward completing their bachelor’s degree, they will receive field-based experiences in Johnston County. The Associate in Science (Teacher Education Concentration) is the first of its kind within the North Carolina Community College System, and will serve as a pilot to help prepare teachers who serve rural communities in the state. In its initial phase, the dual enrollment program is recruiting high school students and employees in the Johnston County Public Schools, as well as current Johnston Community College students. “Johnston Community College has trained early childhood educators for many years, and we are excited about the opportunity to now partner in this dual-enrolled program and grow our own highly-qualified teachers in Johnston County,” Johnston Community College President David N. Johnson said. Rather than being a traditional 2-plus-2 transfer program, the dual enrollment program is taking a “wrap-around approach” to identifying and supporting future teachers. Future teachers will be identified as early as high school; and once students begin working on their associate’s degree at Johnston Community College, the NC State College of Education will be involved throughout the program by providing academic advising, co-teaching, synchronous classroom experiences and on-campus enrichment opportunities that align with the college’s course of study. The Associate in Science (Teacher Education Concentration) program will enroll its first students in Fall 2019. You can learn more about the program here or complete the form below to have someone contact you. Complete this form to have someone contact you about this program. If you selected "other" in the previous question, please identify your affiliation.